OLIMP Therm Line® Man is a slimming formula dedicated to men, designed on the basis of substances that are effective and safe for the body. The preparation includes natural plant extracts, standardized for the content of bioactive substances, caffeine, vitamins and minerals. Garcinia Cambogia is a plant extremely rich in hydroxycitric acid (HCA). This compound suppresses the excessive appetite and promotes the optimization of carbohydrate-fat metabolism. Thanks to this, it significantly increases the effectiveness of the slimming treatments. The main mechanism of its action includes inhibiting the expression of ATP-citrate lyase, which controls the processes of fatty acid synthesis from carbohydrates. In addition, HCA improves glucose transport and reduces tissue resistance to insulin. Bitter orange extract (Citrus aurantium) provides many pharmacologically active compounds, among which synephrine is the leader. This alkaloid became popular after withdrawing an ephedrine from the distribution which is highly potent, but has also a high risk of side effects. Synephrine seems to be much safer, and at the same time similar and effective. It has affinity for β-adrenergic receptors, and thanks to their activation, it intensifies metabolism and promotes the increase of basic metabolism. It works synergistically with caffeine, which can also be found in the presented supplement. Caffeine is one of the most popular substances, widely used for both psychostimulant and slimming purposes. It positively affects the energy level, which usually decreases with limiting the supply of calories. It can also increase the resting metabolism, which results in a faster loss of unnecessary kilograms. By limiting the breakdown of cAMP, it promotes the activation of enzymes that determine the process of decomposition of fat compounds in the body. Caffeine is also known for suppressing an appetite. Gurmar leaf extract (Gymnema sylvestre) contains a number of bioactive ingredients, among which gymnemic acid plays the most important role. It has a positive effect on a glucose metabolism and improves the carbohydrate metabolism. It inhibits the rate of sugar release to the bloodstream, and additionally promotes the use of energy for the needs of the body system. It normalizes an insulin secretion. It also has a unique property - it temporarily unables to feel the sweet taste. It works great for people who can not cope with the addiction to sweets and consume the excessive amounts of carbohydrates. The Korean ginseng extract (Panax Ginseng) shows a vitalizing and anti-stress properties. It adds the energy, but without an excessive stimulation. It has a positive effect on memory and mental abilities. It is also recommended for men who struggle with weakened libido and want to strengthen their sexual performance. The supplementation with the Korean ginseng extract helps painlessly pass through the demanding period of reduction, promotes the improvement of the comfort of life, allows to maintain psychophysical and sexual fitness even with a drastic cut in the amount of calories consumed. The extract of cayenne pepper (Capsicum frutescens) is an excellent source of capsaicin. This compound can be called one of the strongest natural thermogenics. By stimulating the production of epinephrine and norepinephrine, it significantly increases postprandial thermogenesis and enables fat utilization to produce the heat. Capsaicin may also affect the activity of the polypeptide hormone, called adiponectin. It is crucial for the proper course of all major metabolic processes. The cayenne pepper extract also shows anti-inflammatory properties and inhibits the secretion of inflammatory mediators in an adipose tissue. Specialists point to the correlation between the chronic inflammation and the tendency to gain weight. Sinetrol® is a patented composition containing the extracts from guarana seed and citrus fruit. It provides both caffeine and unique polyphenols, which are known to have a beneficial effect on the rate of fat loss. Compounds of this type favour triglyceride decomposition and, additionally, are health-promoting. They eliminate the intensity of oxidative stress, prevent metabolism disorders, which are often the starting point for obesity. Niacin, or vitamin B3, although it is not a burner in the strict sense, it is often associated with slimming. It can speed up the reduction and make it more efficient. This vitamin is involved in the metabolism of proteins, carbohydrates and fats and affects metabolic changes leading to the release of energy from food. In addition, it participates in the production of certain hormones, including testosterone important for men. Black pepper extract is an extremely valuable component of the presented supplement. It is standardized for the content of the most important bioactive compound, which is piperine. This alkaloid works in two ways. On one hand, it has a slimming effect (promotes the increase of lipolysis and improve thermogenesis), on the other hand it improves the absorption of other substances contained in the preparation, and thus increases its effectiveness. Zinc is one of the most important trace elements for the body. Its deficit is particularly harmful for men - it can lead to lowering the testosterone levels and weakening the fertility. In addition, it correlates with an increased risk of sexual dysfunction. Zinc is also involved in glucose and insulin management. The deficiency of this element negatively affects the glucose tolerance, which promotes both diabetes and obesity. Selenium is another trace element of significant importance for the proper functioning of the body. It has a strong antioxidant effect, promotes the reduction of chronic inflammation, has a positive effect on the immunity and determines the fertility. It also regulates thyroid functioning, which in turn determines the metabolism. People with hypothyroidism usually struggle with maintaining their normal body weight and gain weight even when they stick to the diet. 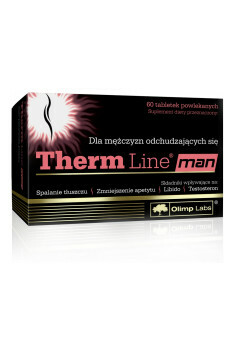 In summary, OLIMP Therm Line® Man is ideal for men who need a fast-acting and effective burner. An undoubted advantage of the supplement is the lack of aggressive and controversial substances in the composition. It can be recommended to people who start their adventure with fat burners and for the first time will use such support during the reduction period. 2 capsules 2 times a day, washing down with a lot of water, 30 minutes before breakfast and dinner or training. 2 tablets 2 times a day, washing down with a lot of water, 30 minutes before breakfast and dinner. The supplement contains several compounds that have a stimulating effect, so you should not take it in the evening. In addition, be careful with combining it with other preparations, for instance the pre-workout supplements based on stimulants. The dose recommended by the manufacturer (4 tablets) is enough to notice the expected effects quickly. In spite of everything, it is worth checking the individual tolerance of the body and for the first 2 weeks of supplementation, take half the recommended dose, which is 2 tablets a day. Filler - microcrystalline cellulose, substances glazing - polyvinyl alcohol, polyethylene glycol, talc; bulking agent - cross-linked carboxymethylcellulose sodium salt; substances, anti-caking agents - silicon dioxide, magnesium salts of fatty acids, color - titanium dioxide. Sinetrol patented formula of complex of extracts of plant origin, extracts containing: from dark red and orange, grapefruit and guarana standardized high polyphenol content of caffeine to 3%. Due to the thermogenic potential sinetrol, showed synergy in combination with other thermogenics is the ingredient in slimming and fat reduction. Due to the relatively low content of caffeine it may be used in the evening, even in persons having a sensitivity to caffeine. Bitter orange extract is widely used in weight reduction process, among athletes, active people and people with so called "sedentary lifestyle". It is a source of synephrine and octopamine, which in combination with caffeine and polyphenols contained in green tea affect lipolysis, releasing fatty acids from adipocytes, by causing increased energy expenditure, burning them in the sources of vital energy cells (mitochondria). Extract of grapefruit (Citrus paradisi ) fruit (Fructus citri paradisi) plants available only with imports, is food and medicial raw material. It is a source of sugars, flavonoids, carotenoids, pectin and vitamins (B group, C, E) and Furanocoumarin (due to the influence of the activity of the liver may impede the bioavailability of medicines). Thanks to naringin, naringenien and nabiletin shows high antioxidant potential, influencing the reduction in the level of free radicals. Supports the processes of fat reduction. Influences the level of lipid and insulin the body and increases immunity. The extract of Guarana (Paulinia cupana) contains purine alkaloid (caffeine), acting as a stimulant on the body of the athlete. The caffeine content in the seeds of guarana is between 4 and 8%. Powdered seeds are the raw material supplements. Thanks to the slow release of caffeine in the human digestive tract stimulation takes longer and is less violent than the consumption of strong coffee or infusions of caffeine. The extracts of Guarana support the athlete body, they increase their exercise capacity and endurance (especially aerobic). Guarana is also a component of fat burners. In the sports supplementation preparations containing sinetrol are served in programs fat reduction and weight loss. Available at www.muscle-zone.pl. Gurmar (Gymnema sylvestre) is a tropical plant, regulating blood glucose levels, having a number of active substances alkaloids, flavonoids, chlorophylls, triterpene saponins and stigmasterol. It is used as a slimming supplement (also with obesity and overweight), reducing appetite and blocking taste receptors (especially sweet). Lowers the level of triglycerides in the blood. It is available as mono-preparations, also as multi-component weight loss and insulin-active supplements. Dosage: Before meals in divided doses, at least 200 mg per day based on gymnemic acid.